Toshiba has made a name for itself by producing an impressive range of machines to match almost any budget. The Satellite Pro L300-1AD is an affordable option aimed at the corporate user. In keeping with its professional aspirations, you'll find quality materials that are more than capable of withstanding the daily commute. The plastics are hardwearing, and it offers similar quality to the HP 550 and Asus X58C. We also found it remained cool to the touch after long periods of use. At 2.6kg, it's light enough to carry around without trouble. The 15.4-inch screen comes the closest to matching the HP 550, offering crisp, colourful images. Contrast is impressive, and there's enough space to work with several windows open at the same time. Graphics are handled by Intel's latest GMA 4500M integrated chipset, as with the Acer eMachines E520-571G16Mi. 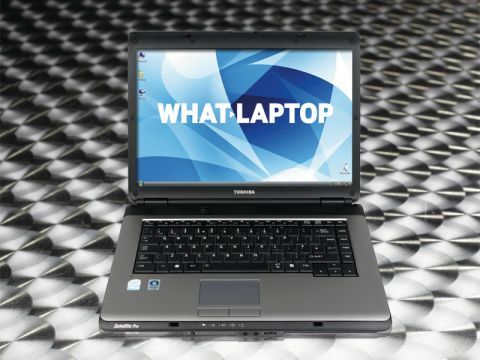 It offers the best compromise between power and battery life, with the laptop lasting for 195 minutes between charges. All our test programs ran with ease, and you'll have no trouble using applications such as Adobe Photoshop or simply browsing the internet. The chassis is sensibly designed, offering plenty of space for a good-sized keyboard. The keyboard itself offers the best mix of quality and usability in this group. The keys are firmly attached and they don't rattle under use. Peripheral keys are separated from the main board slightly, which makes it much easier to use them without looking. The L300 is unfortunately limited when it comes to features. The 120GB hard drive is the least capacious in this group, and those with large media collections may be better served by another laptop. There is also no memory card reader, so you won't be able to access photos directly from your digital camera. This machine suffers from the same problem as the Acer and HP when it comes to the location of the USB ports. Two of them are too close together, so if you have bulky peripherals, you can't use more than two simultaneously. The ExpressCard slot is a welcome inclusion, providing an alternate way of adding peripherals. Although limited when it comes to features, the Toshiba is a very convincing corporate machine. Its high-quality materials and impressive ergonomics make it a laptop that professional users will find difficult to ignore.